Scott Gorsuch rushes for 240 yards including touchdown runs of 75, 65 and 57 yards in Whitewater’s homecoming victory. Going into their homecoming game against McFarland Friday, the Whitewater High School football team knew it must have a victory if it had any realistic hopes of making the playoffs. The Whippets got that much-needed win by besting McFarland 49-43 in an offensive shootout. With the win, Whitewater is now 4-2 overall, and 2-2 in the Rock Valley Conference North. Even with the win, Whitewater probably needs to win two of its final three games to make the playoffs. In the McFarland victory, the two teams combined for nearly 1,000 total yards of offense, with the Whippets accumulating 534 of those yards. Whitewater’s running game was at its best Friday, as the team tallied 406 yards on the ground in just 40 rushing attempts. That is more than 10 yards per carry. 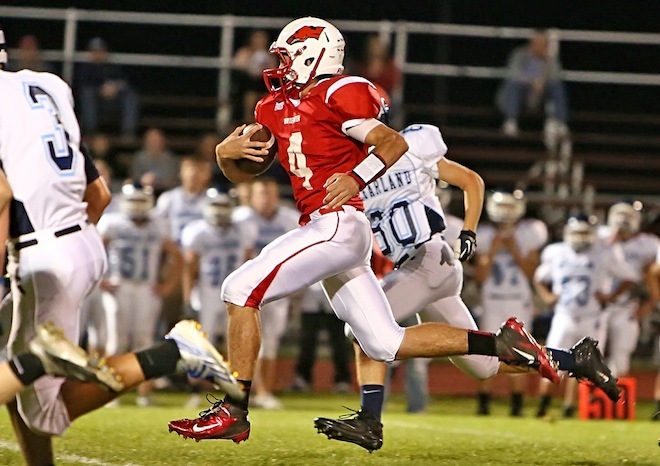 Quarterback Scott Gorsuch was unstoppable as he rushed for 240 yards on only nine carries. All but 43 of those yards came on three long touchdown runs of 75, 57, and 65 yards. Gorsuch also connected on five of 10 passes for 128 yards and two TDs. He was not intercepted. McFarland got on the board first on a four-yard run with 8:14 left in the first quarter to take a 7-0 lead before Whitewater even had the ball. That changed quickly, though, as Gorsuch scored on Whitewater’s first offensive play from scrimmage, a 75-yard scamper. Peter McCrae’s extra point kick was good and the game was tied at 7-7 at the 7:53 mark of the first period. The Whippets took the lead with 5:30 to go in the first quarter on Gorsuch’s 57-yard run. McCrea’s kick made it 14-7. McFarland tied the game with just over one minute to go in the first quarter on a 74-yard run and extra point kick. The second quarter was all Whitewater as the Whippets score three times. The first score came with 10:03 to go in the quarter on Gorsuch’s 65-yard burst and McCrea’s extra point. With 3:33 left in the quarter, Gorsuch connected with Dallas Jones for a 24-yard touchdown pass. McCrea’s kick made it 28-14. The Whippets pulled off a huge scoring play with no time left on the clock to end the first half. John Saylor took a short pass from Gorsuch, made a couple of McFarland tacklers miss, got some good downfield blocking, and scored on a 31-yard pass and run. That made it 35-14 at the half. Whitewater went up 42-14 with 6:21 to play in the third quarter on a two-yard run by Saylor and McCrea’s extra point kick. “We held them pretty much for the second quarter and half of the third,” Parr noted defensively. That changed halfway through the third quarter when McFarland made a big comeback. McFarland scored 22 unanswered points, with two of those scores coming on trick plays. Parr noted that two of the scores came on double passes, where the first pass was behind the line of scrimmage and then the pass receiver in turn made a second pass. Two of McFarland’s three second-half touchdowns scores came within 18 seconds of each other in the fourth quarter. After McFarland scored on a 13-yard pass, the Spartans recovered an onside kick, and then scored immediately on a 37-yard pass to make it 42-36. Whitewater stopped the McFarland streak with 8:15 to play in the game when Saylor scored on a 19-yard run. McCrea’s kick made it 49-36. Saylor finished the game with 139 yards on 27 carries. McFarland scored once again on a 55-yard pass to cut the Whippet lead to 49-43, but Whitewater turned away two late Spartan efforts. In one case, defensive back Joe Bullis intercepted a McFarland pass in Whitewater territory. As the game clock wound down, McFarland drove to the Whitewater 30 yard line, but a sack by Joey Michaels ended the game. Offensively, Whitewater did not turn the ball over once. “We did a great job protecting the ball,” Parr said. Another key was the kicking of McCrea. In the first five games, McCrea had struggled with his extra point kicking. Not so in this game as McCrea connected on all six attempts. Defensively, the Whippets did give up 451 yards, with 197 of those coming on the ground (28 attempts) and 254 coming through the air. McFarland attempted 34 passes, completing 18, but also had the one key interception late in the game. The Whippet boys face a huge challenge Friday when they travel to Big Foot to take on the undefeated and No. 1 ranked team in Division 4. The game is at 7 p.m.